Eclairs are the hottest pastry trend in Paris, or so I’ve been told by many friends who have recently visited the City of Light. I don’t see a lot of variation in the eclairs sold in bakeries in my area, and a quick search of Parisian eclairs was more than enough to rekindle my interest in these classic pastries! I was eager to learn what new techniques were being used to make eclairs the new macarons in Paris and decided to sign up for then Eclair Class at The Pastry School. 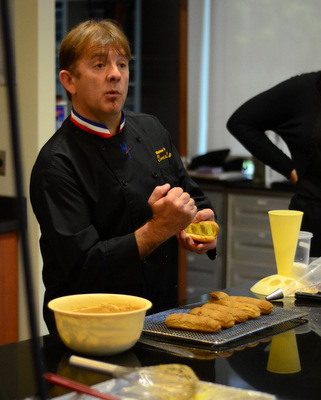 The Pastry School is owned and operated by Chef Stephane Treand. 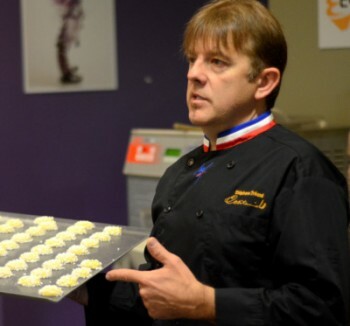 ChefÂ Treand is an MOF pastry chef, recognized as one of the most skilled in his profession and one of only four MOF pastry chefs in the United States. His passion is pastry, both making it and teaching others how to make it, and there is no more skilled teacher to learn from. 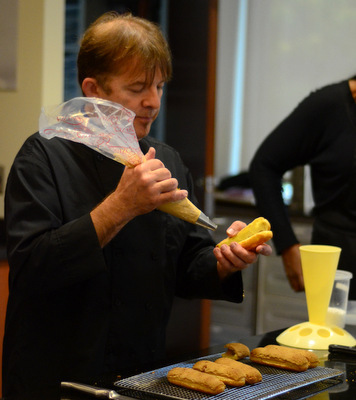 The Pastry School is where Chef Treand offers a wide variety of classes to anyone who is also passionate about pastry. He has multi-month professional-level classes that aspiring pastry chefs might want to take, as well as single day and multi-day classes for those looking to learn new skills or refine their techniques. The quality of the instruction is outstanding and Chef Treand is both engaging and informative as an instructor, which makes the classes a lot of fun. 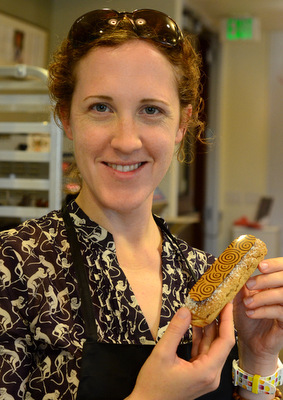 The Eclair Class is a single day class, which means it is easy to fit into any baker’s busy schedule. We got things started with a classic base recipe for choux paste that is versatile enough to be used in both savory and sweet applications. Chef Treand demonstrated the proper technique for mixing the paste and piping eclairs, then we worked in pairs to make our own batches. We topped all of our eclairs with a crunchy, streusel-like topping that not only added flavor to the choux, but it helped give the eclairs a near-perfect shape as they baked. 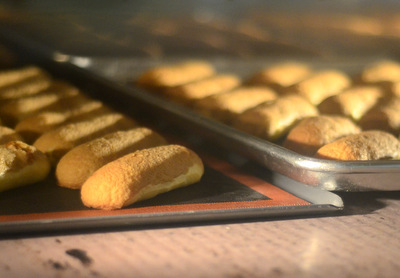 The topping was made of a mixture of flour, brown sugar and butter, which was rolled into a very thin sheet, frozen and cut into strips that were applied to the unbaked choux. 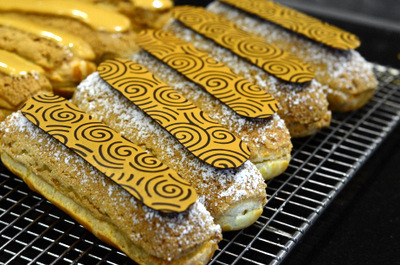 It really made a difference in the look and flavor of the finished pastries, adding just the right amount of additional sweetness to the eclairs! 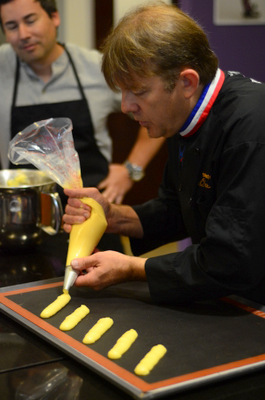 Once all our eclairs were baked, Chef Treand demonstrated a basic pastry cream that could easily be flavored to create multiple different fillings. The cream was rich, yet light, and just the right consistency for pairing with the choux. 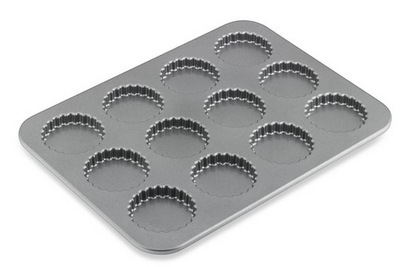 While some people prefer to try and pipe their filling in through small holes in the bottom of their pastries, Chef Treand prefers to make a careful cut along one side, allowing for a more generous amount of cream to be piped into place. 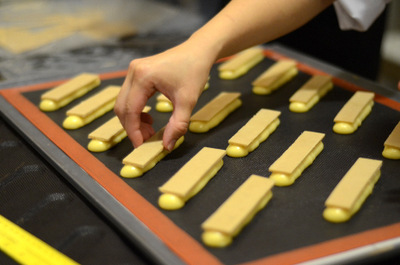 The finished eclairs were stunning to look at, especially once Chef Treand topped them with elegant chocolate decorations that matched the shape of the eclairs and made the pastries look like they were headed into the showcase at a high end pastry boutique. We made dozens of pastries and loaded up boxes (with the ones that we didn’t eat right away!) to take home and enjoy later. The class was delicious and fun – and made the whole eclair process seem so effortless that I want to make them a lot more often! I’ll also be back for more classes in the future, to fine-tune my skills in other areas of pastry. Currently, The Pastry School is located in San Clemente, California, but it will be relocating to a new facility in Costa Mesa in September, where Chef Treand will not only continue teaching fantastic baking classes, but where you’ll also be able to pick up some of his signature pastries in an adjoining patisserie!